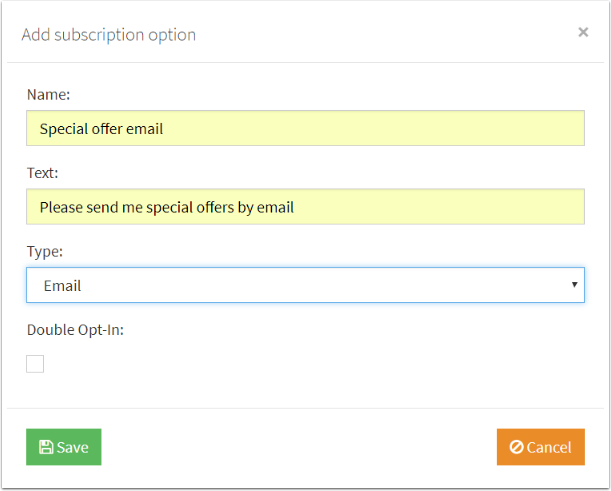 Help CentreUsing SuperControl Managing your subscription optionsHow to add your new subscription options? 1. Go to Admin > Subscription options. 3. Enter a "Name" - this is will be used as a reference only (not seen by the guest). Enter the "Text" - enter the subscription question eg. Please send me special offers by email. Enter the "Type" - This is the method you will contact the guest. What does Double opt-in mean? Ticking this box means that when a guest ticks to subscribe, they will be sent an email containing a validation link. Their consent for the subscription will not be allowed unless they click this link as well. If you do not tick the Double opt-in field, the guest will be consenting to the subscription as soon as they tick the box on your online forms. Prev: How do I add contacts to my address book? Next: How do I remove a subscription option?